Watch winders have been topic of this blog several times in the past. In all cases, the principle of the winding system was always the same. Besides a few technical thingies like a rotating programme that could bet set manually or using a LCD display instead of just a simple switch, the packaging – or casing – was most of the time the most important aspect. A leather box, a winder with wood finish or just a low-cost plastic case. In all cases (no pun intended), they worked the same way. The Gyrowinder of German company Döttling, lead by CEO Markus Döttling, is something entirely different. As you may know, we are a sucker for NASA and Apollo stuff, so it was a nice surprise to learn about the Gyrowinder and how Döttling was inspired by the gyroscope that he’d seen during a visit to the Kennedy Space Center in Florida. This piece of equipment is used to train NASA astronauts to prevent them from having spatial disorientation. Since the use of synthetic oils in watches the use for a watch winder has become less important. The oil is not going to thicken that fast when the watch is not being used. However, it is – of course – better to keep a watch running. The use for a winder could also be valid when you have a lot of watches and don’t have the time to set them every time you put them on. Are you that important and busy? We’d love to meet. Another type of use could be when you have a watch that has quite some complications and it is a matter of difficulty and time to set it correctly. On the other hand, if you really love watches, we don’t believe that this is an important issue as well. So love to fiddle around with your complicated watch on Sunday morning. 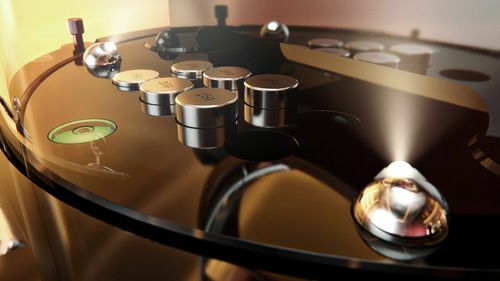 No, the real use of a watch winder is because they are cool. Especially when they look like the new Döttling Gyrowinder. Watch winders like these are just a piece of art and probably can count on its own share of fans. Döttling, the family owned company that has been making fine handcrafted mechanical safe equipment since 1919, created this Gyrowinder with the utmost care and precision. 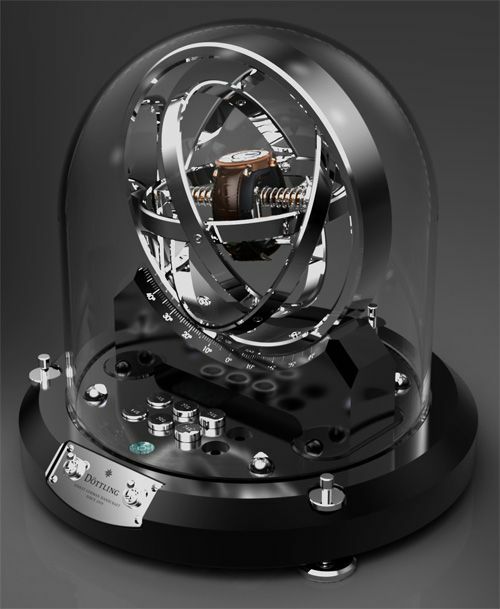 Instead of the usual mono axis winders (turn left or right, or both), this winder – as its name suggests – is able to rotate the watch 360 degrees. More or less all the same movements you can make with your arms. 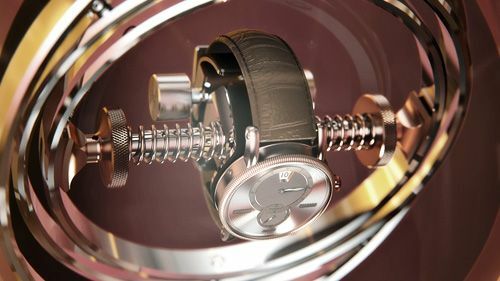 As you can see on the picture below, the Gyrowinder comes with a set of counter weights to set the right balance for your watches.